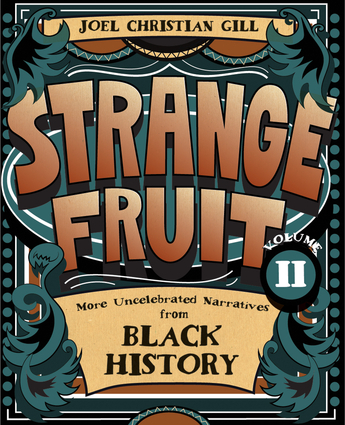 I very much enjoyed the first Strange Fruit book, so much that I included it in a chapter in a book on children's literature in the classroom. I was pleased to see its follow-up on the shelf at one of my local bookstores, and I snapped it up quickly. I admire the author Joel Christian Gill's politics, art, and intentions with this project, and I am glad to help share some of those here. Not only is this book well researched, it also incorporates actual text from its subjects when possible. What I liked most about this book is that it covers a wide range of people I had never heard of, bringing to light truly "uncelebrated" people like: Jourdon Anderson, a freed slave who wrote a wry, pointed letter to his former owner; Stagecoach Mary Fields, a pioneering postal worker who was quick with a gun and her wits; Willie Kennard, who was made sheriff with the expectation that he would immediately be slaughtered; Cathay Williams, a woman who disguised herself as a man to serve as a soldier in the Civil War; Blind Tom Wiggins, a blind, autistic slave who became a highly accomplished musician; Millie and Christine McCoy, conjoined twins who toured the world as The Two-Headed Nightingale; Victor Green, the author of a guidebook for black people traveling across the US, and Eugene Bullard, a WWI fighter pilot who was celebrated in France but ignored in his homeland. 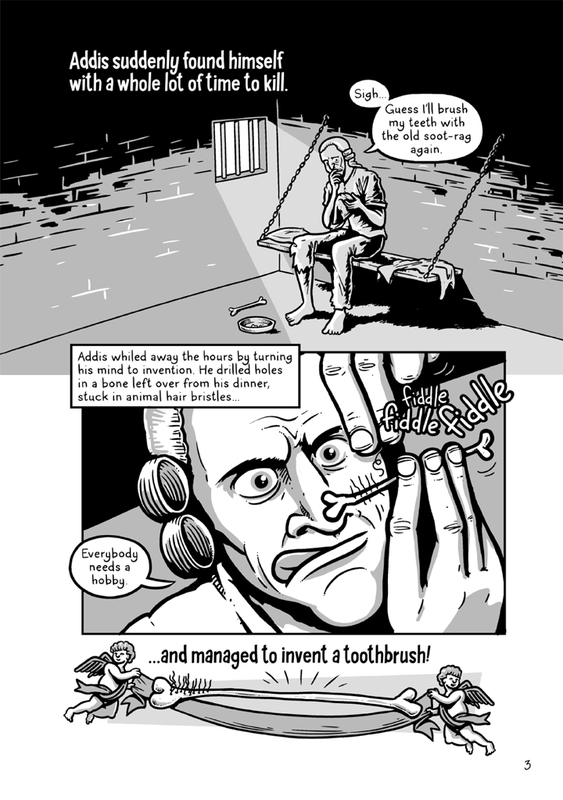 These tales not only inform the reader about notable figures, but also the social conditions under which they lived and their contributions to our culture. Strange Fruit Volume II is exceptional work on an important, overlooked aspect of US history. 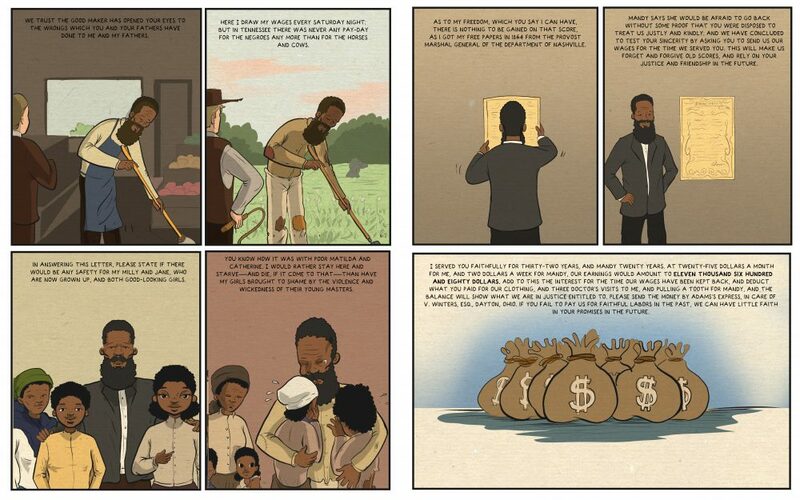 Impressively, I feel it could be read and taught in multiple grade levels, from elementary to high school. Additionally, more so than the first volume, this one is more uniform in terms of its story presentations. Each one has its own title and has space to breathe. The first book felt more like a collection of tales that may have appeared elsewhere, and had mixed formatting. This one seems much more intentional and measured, providing more coherence and polish and showing much more confidence and craft in its artwork and storytelling. This book is one of the few sequels that is better than its predecessor. This book's creator Joel Christian Gill is the the Chair of Foundations at the New Hampshire Institute of Art. In addition to the Strange Fruit books, he has also published a couple of extended biographies of African-Americans in his Tales of the Talented Tenth series, on lawman Bass Reeves and motorcyclist Bessie Stringfield. He speaks more about his comics work in this interview. I was not able to find many reviews online for this book, but what I did locate was positive. Terri Schlichenmeyer called it "a quick-to-read curiosity-satisfier is exactly what’s needed for home or school." For those interested in hearing Gill speak more about the need for sharing these uncelebrated narratives, you can listen to this interview . 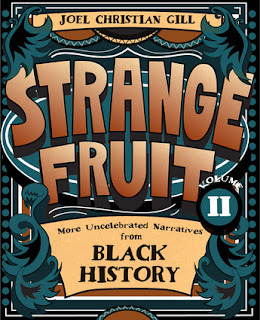 Strange Fruit Volume II was published by Fulcrum Publishing, and they offer more info about it here. I found this book at my local independent bookseller a few months ago and immediately had to buy it. 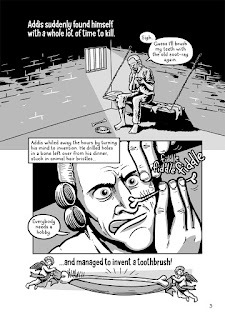 I love books about the history of common objects, like the Uncle John's Bathroom Readers or the various gallimaufries (look it up) by Charles Panati. 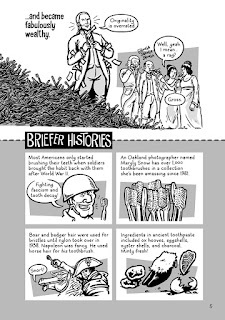 That this book presented such information in comic form just made me excited, and I am glad to report that this book did not disappoint. 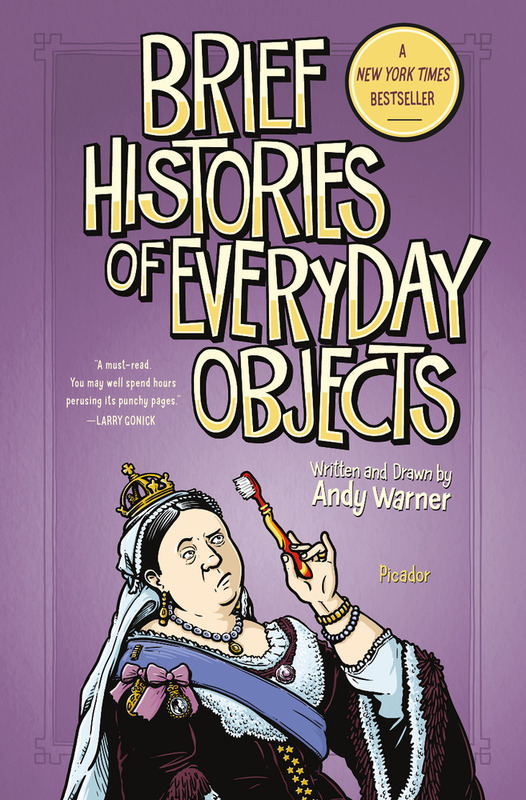 Brief Histories of Everyday Objects is chock full of interesting, surprising, and enchanting tales of invention and gorgeous, meticulous drawings. I loved reading it. The tales within are presented in various sections about items you would find in the bathroom, bedroom closet, grocery store, kitchen, living room, coffee shop, office, bar, and great outdoors. As you can see from the excerpt above, each section has 4-5 entries that run 4 pages each, making a very accessible and readable book. 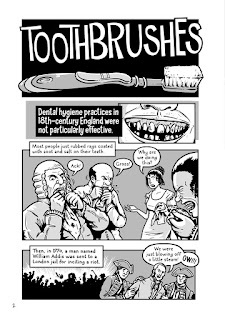 I learned much about things I was ignorant about, like the origins of the toothbrush or paper bags, and I was also surprised to find I was also misinformed about other items, like the board game Monopoly (which was supposed to be an anti-capitalist teaching tool!) and indoor toilets. 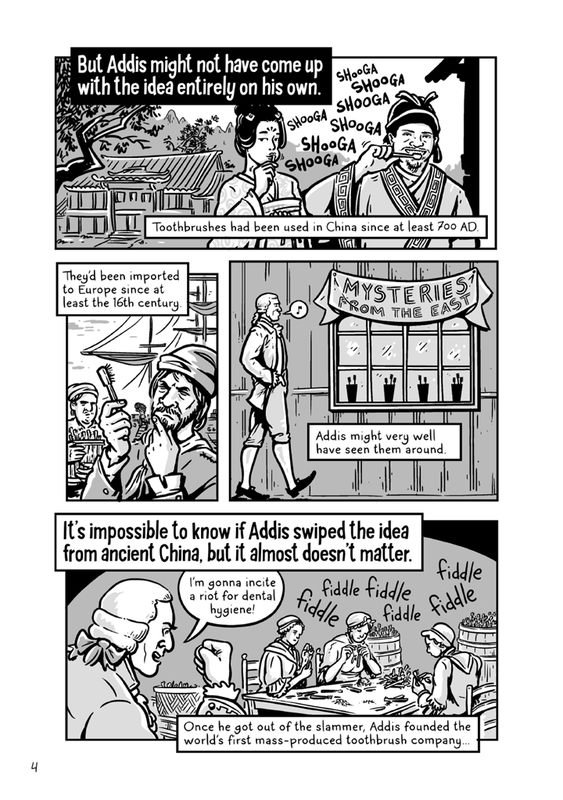 And adding icing to any already delicious cake, the author injects a great sense of humor, social commentary (particularly about the disparities women inventors faced), and attention to ancillary matters (like patents and business dealings) that pertained to the topics at hand. The book lived up to my every expectation. I only wish it were longer (or had a sequel already!). 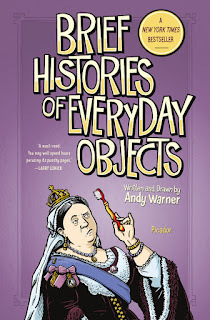 This book's creator Andy Warner has taught comics and cartooning in a number of prominent settings, and he has also published in a number of venues. 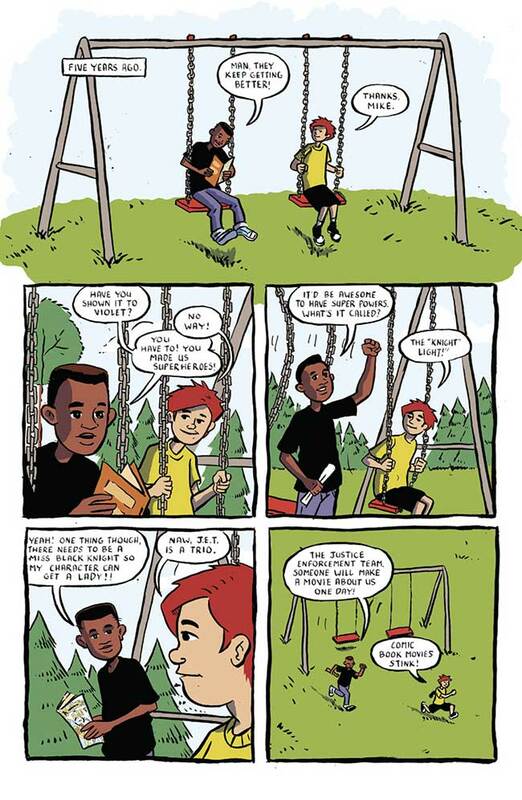 Notably, he is a contributing editor for award-winning online webcomic collective The Nib. He speaks more about his art and career in this interview. All of the reviews I have read about this book praise it. Publishers Weekly called Warner "a deft cartoonist, able to convey a lot of information, humor, and emotion within a single panel." Johanna Draper Carlson called the book "a terrific read, the kind of popular history full of trivia we used to see more of before the internet. 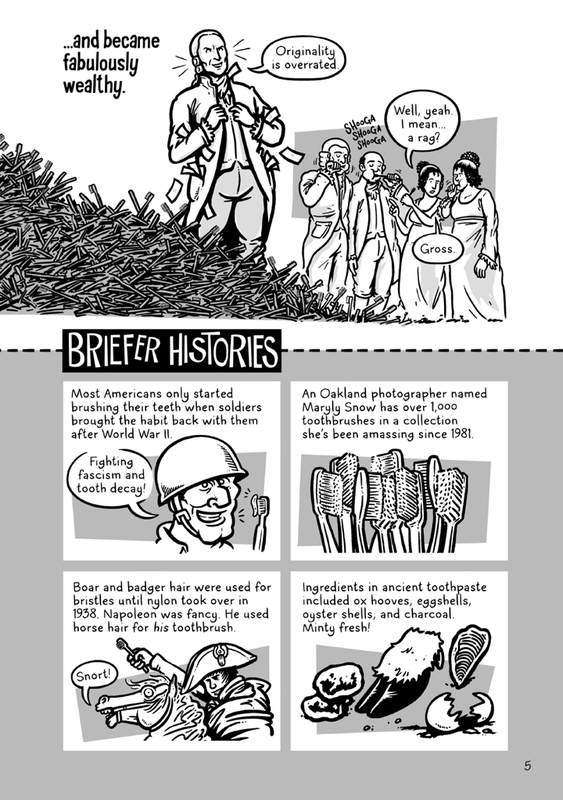 "Megan Volpert wrote, "The entire book can be read cover to cover in about 90-minutes with fair attention to detail, but Brief Histories of Everyday Objects is also dense enough to be worth savoring." 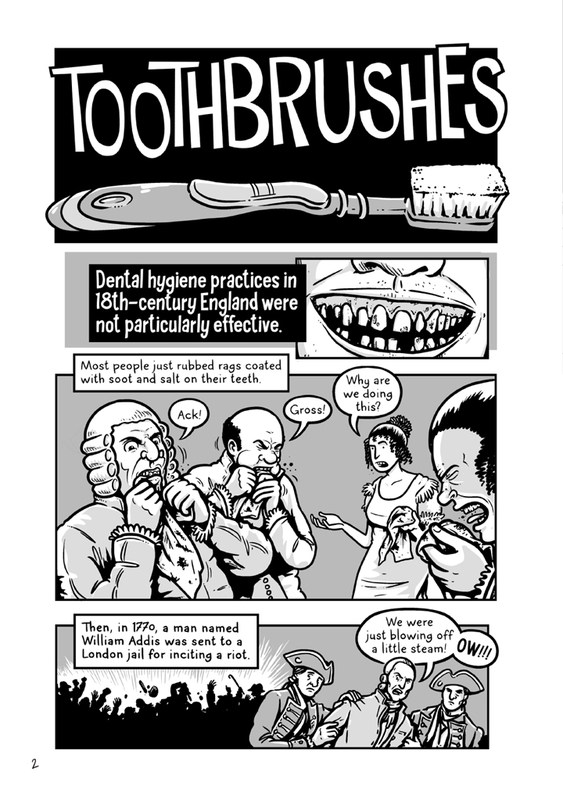 Brief Histories of Everyday Objects was published by Picador, and they offer a preview and more here. 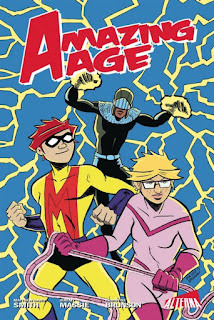 Amazing Age is a fun book, a colorful superhero adventure based on comics and characters the writer created when he was a boy.The story follows a boy named Sam who makes comics about superheroes based on his friends. Flash forward a few years, and those same friends do not associate with each other any more and Sam has not made any comics in the years since his dad died. 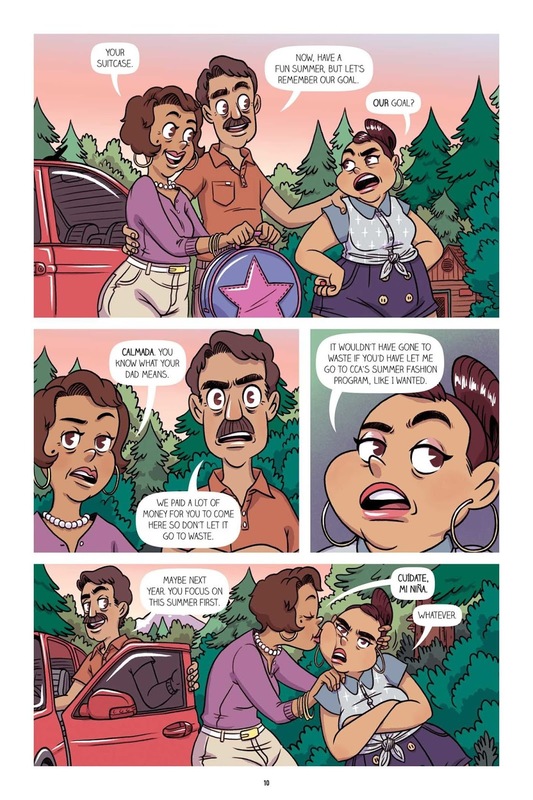 Amazingly, those three former stalwarts all get teleported to a world where those old comics were set, and they find that the characters from those old stories are real. 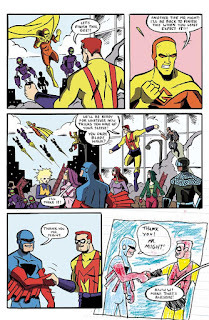 The supervillains there have banded together in a nefarious plot to kill all the superheroes, and the trio are brought in because they are the greatest heroes that planet has ever seen. Saving the world is a huge burden for these teens, who have not spoken in years, don't know how to use their powers, and really just want to go home. Not only do they need to resolve their own personal dynamics, they need to avoid the dire machinations of the evil villains who want to annihilate them. What I liked about this book is that it hearkened back to the kinds of all-ages superhero comics I liked as a child. There are silly acronyms, a plethora of super-powered characters, and high stakes adventure. 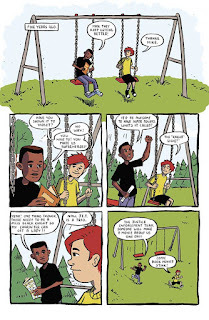 It also has a fun, gripping plot, good characterizations, and interpersonal situations that I feel are relatable for children and adolescents alike. Also, I enjoyed that these are superhero comics that are not so bombastic or sexualized, as sometimes they are wont to be. 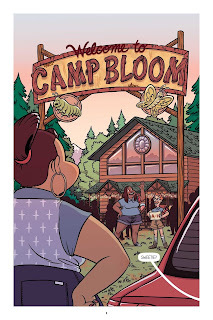 This book was a collaboration between writer Matthew D. Smith, artist Jeremy Massie, and colorist Christine Brunson. Smith and Massie have worked on other comics together, including Blood-Drenched Creature Double Feature. Massie has a few solo titles to his credit, including All My Ghosts and a quirky superhero tale called The Deadbeat. Brunson has colored a number of comics over the years, as well as writing the webcomic Undead Norm. 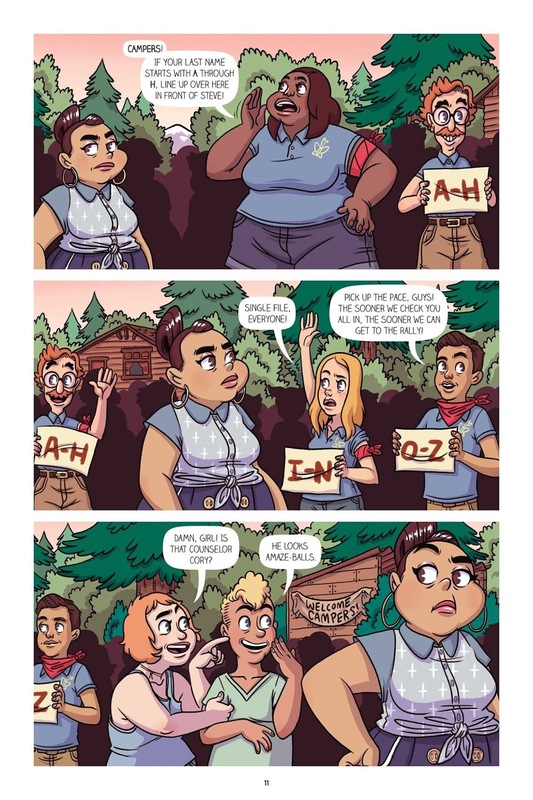 I did not find many reviews of this comic online, but the ones I did locate were very positive. 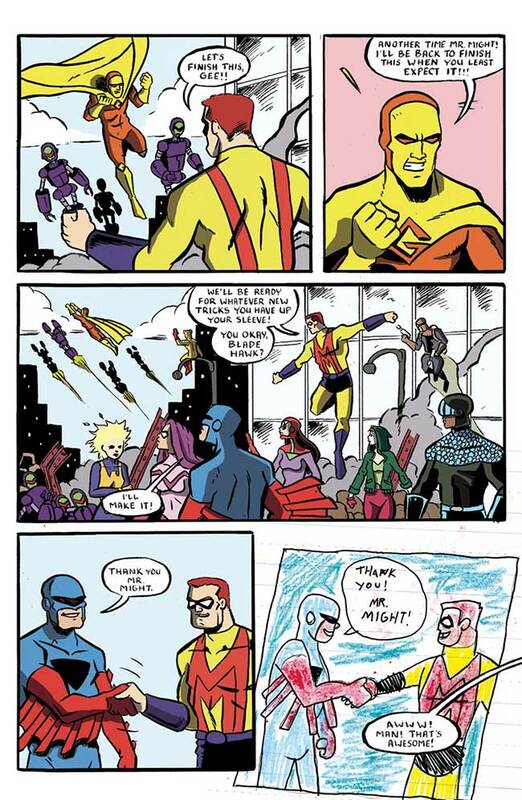 Warren Elliot wrote, "The art continues to nicely blend realism with cartoonish fun, giving Amazing Age a very appealing Silver Age look!" Rachel Bellwoar rated it 4.7 out of 5 stars and summed it up as "nostalgic catnip, right up there with Stand By Me and Stranger Things in the 80's friendship department." Amazing Age was published by Alterna Comics, and they have more info about the book here. This collection collects the five issue limited series released serially. It also has copious back pages that show the characters as originally drawn by Smith when he was a boy, which reminded me of my own drawings at a similar age. Long-time readers of this blog should know that Jaime Hernandez is one of my favorite comics creators. He has won multiple Harvey and Eisner Awards for the long-running Love and Rockets series he co-created with his brothers, and I loved seeing his work in various anthologies over the years. 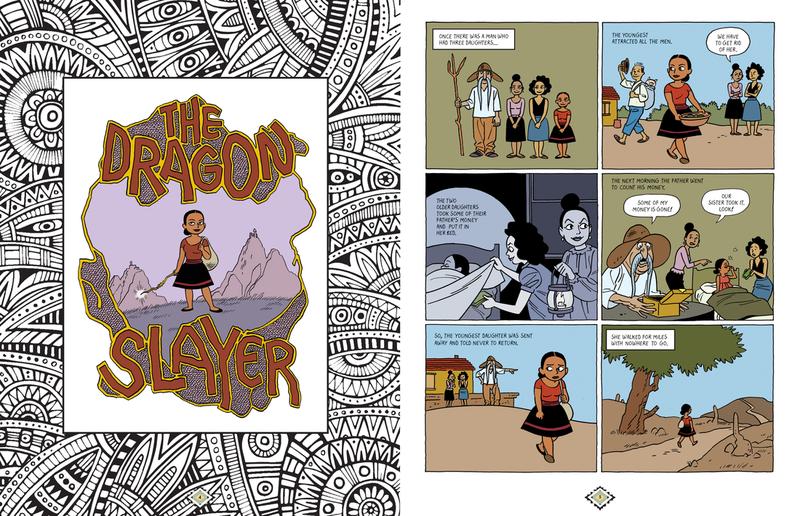 The Dragon Slayer, notably, is his first foray into comics for younger readers. It is a thin book, but it is packed with beauty, energy, and fun. 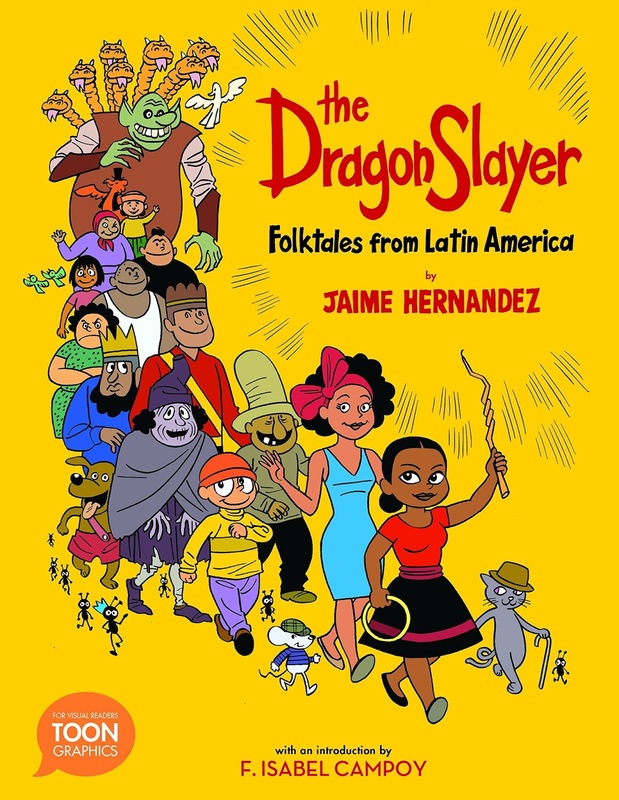 After an introduction by F. Isabel Campoy that gives context to Latinx folktales, there are three 10-page stories. The first, titular story is about a young daughter who gets kicked out her house but is gifted a magic wand that helps her find her way in the world and (yes) eventually kill a horrible dragon. The second tale "Martina Martinez and Pérez the Mouse" is about a beautiful woman who marries a mouse but has to deal with the fact that he has drowned while fishing a delicious onion out of some soup. The third is "Tup and the Ants," about a youngest son who is shunned by his parents but finds his way to success via befriending a colony of ants. Not surprisingly, I was not familiar with any of these stories, and I found them full of magic, wonder, and surprises. 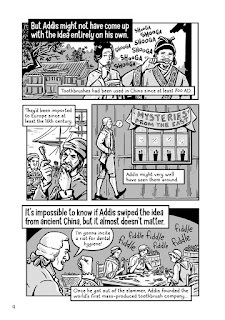 They are fun, impressive tales that have a good sense of whimsy. Also, the artwork is clean and simple in appearance, but it packs much emotion and action. I loved this book, and I cannot wait to share it with my own children. All of the reviews I have read about this book have been glowing. J. Caleb Mozzocco opined, "It’s a perfect work for adults who grew up on Love and Rockets to share with their children, and it’s an equally perfect introduction to the rich folklore immediately to the south of the U.S." Rob Clough wrote, "The fact that Hernandez chose stories that aren't strictly morally instructive, but instead convey other kinds of information, simply make people laugh, or act as shaggy dog stories makes this volume especially enjoyable." 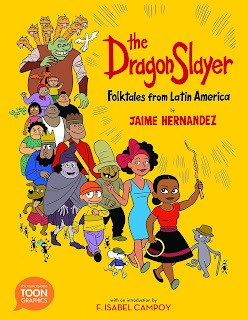 In a starred review, Kirkus Reviews summed up, "Rousing tales, spirited artwork, and rich back matter ensure that this slim graphic novel for kids becomes a rich resource for all caregivers, not just those of Latinx children." 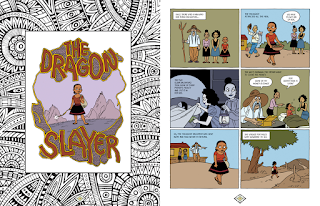 The Dragon Slayer was published by Toon Books, and they offer a preview and much more here. This book's stated audience is grades 3 and up. As I've written in a few reviews over the past year, immigration has been a hot button topic in the US, and an area of great shame and pain. Illegal is a book that shows the faces of those who seek asylum in other countries, the ways that they are taken advantage of by traffickers, the perils they face on their journeys, and the great lengths they go to in order to find better lives. The narrative is told in very dramatic and revelatory fashion, with one thread in the present and one thread in a flashback. This structure is used to great dramatic effect, following a young boy from Ghana named Ebo as he follows his brother Kwame on a quest to get to Europe. Both boys are orphaned and live with their drunk uncle. Kwame is older and decides to leave and find their older sister Sisi who has left for Europe years before. They have not heard from her at all and have no idea what has happened to her, but still Kwame feels he will be successful and could then send for his little brother. Ebo is headstrong however and sets off in hot pursuit of Kwame. The brothers meet up coincidentally, and together they strive to get to Italy. Along they way they have to survive the desert, opportunistic criminals, overcrowded boats, and the open sea. I do not want to spoil what happens in this book, but much of it is grim. It seems to me that the creators here went to great lengths to make the stories and circumstances as realistic as possible. There are many political and economic dimensions to the tale, and most impressively also much heart and human drama. I really felt for the characters and their plights, and I feel any reader would be greatly moved by this story. It is an excellent book that informs about important current events and also sheds insight into life and humanity. The trio that made this book have also worked on four previous volumes, graphic novel adaptations of the Artemis Fowl series. 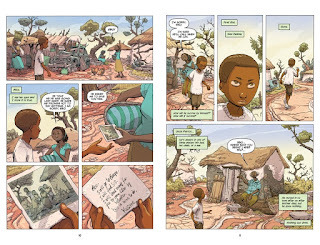 Eoin Colfer and Andrew Donkin are the writers and the art is provided by Giovanni Rigano. Colfer is a novelist who is best known for the Fowl series, Donkin a children's book author/ninja assassin, and Rigano is an artist who has worked on a good number of previous graphic novel adaptations. This interview with Colfer sheds more light on the book and its reception in Europe, where it has garnered much praise and some accolades. All of the reviews I have read about it have been very positive. 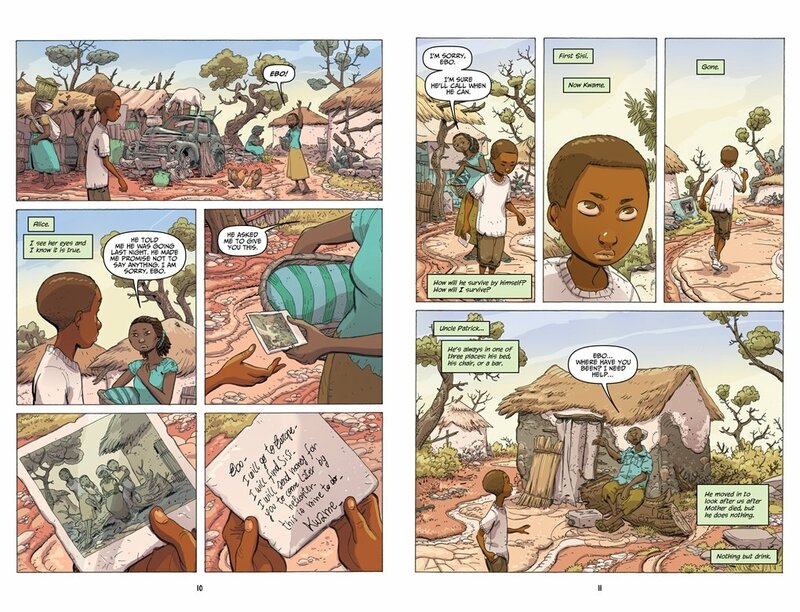 Kirkus Reviews summed up, "Action-filled and engaging but considerate of both topic and audience, Ebo’s story effectively paints a picture of a child refugee’s struggle in a world crisscrossed by hostile borders." Sarah Donaldson called it "a deeply affecting and thought-provoking." In their starred review, Publishers Weekly described it as "achingly poignant." 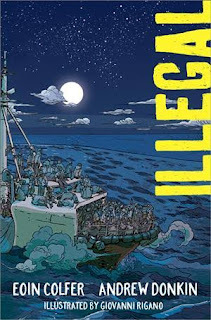 Illegal was published in the US by Sourcebooks. They offer a teaching discussion guide for it here, and there is a video preview available here. 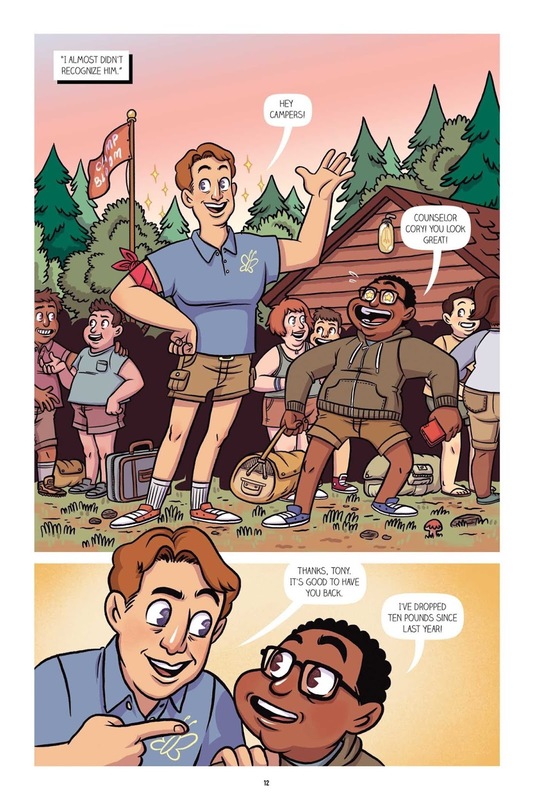 This book is pitched as a children's book, but it does not sugarcoat harsh and horrible conditions, so I'd recommend previewing it before deciding to share it with younger readers. 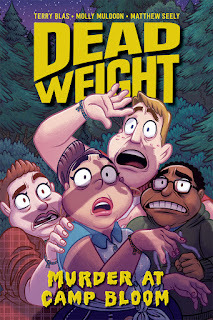 Dead Weight is a murder mystery for YA readers. 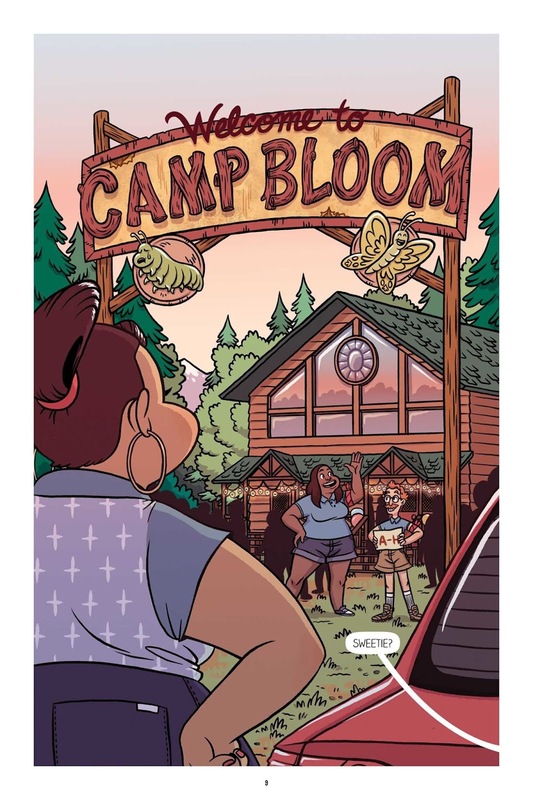 It is set a Camp Bloom, a "fat camp" where young people come to work off the pounds and learn healthy eating habits. 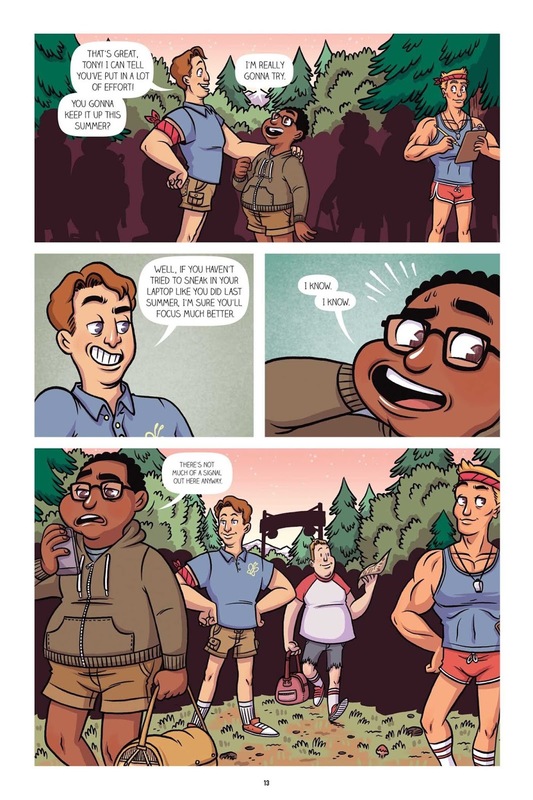 The twist here is that one night two of the campers witness a popular counselor get brutally murdered. Of course, it was past curfew and they should not have been out, so they keep things to themselves. The next day, no one seems to have noticed what happened, and there was a note left to explain the counselor's absence. Also, from what they could see they feel that the culprit was one of the camp leaders, so they do not feel they can go to the adults. So the two campers recruit two of their friends, and the quartet becomes a team of amateur detectives. They are a motley, diverse bunch: Jesse, a Latina girl who would rather be at fashion school than Camp Bloom; Noah, a white boy who is a veteran fat camper; Tony, an African-American boy who is freaked out to have no access to his cell phone or computer, and Kate, an aloof white girl who would rather observe nature than interact with people. They bumble their way through the investigation at first but eventually they get themselves together and solve the mystery. For me the highlight of the book is the vibrant and energetic artwork. I love the character designs and visual storytelling, and Seely's background in animation well informs both. I think that the setting and cast are also big pluses. They might not be the most complex characters, but they are diverse in terms of identity categories, and I appreciate seeing that here. About the plot, I have to say that I did not see the ending come at all, and although there were some visual clues I think it would be impossible for a reader to solve the crime on their own. Still, I enjoyed the plot twists and this book overall. It was a fun, breezy read. Dead Weight is the creation of writers Terry Blas and Molly Muldoon and artist Matthew Seely. Blas has lots of comics credits and is probably best known for his webcomic Briar Hollow. Muldoon is a teacher, librarian. editor, and author who has also written another story for the graphic novel The Cardboard Kingdom. Seely is an artist and animator who has created a segment for MTV's Greatest Party Story Ever as well as a bunch of self-published mini-comics. Those interested in learning more about the inspirations and process of making this book can read this interview (or this one, if you prefer). The reviews I have read about this book have been mixed, with much of the negative criticism aimed at the cast of characters, which are seen more as types than actual personalities. Kirkus Reviews called it a "lighthearted mystery with diverse characters" as well as "an accessible, if not entirely satisfying, read." Johanna Draper Carlson wrote, "Young readers who aren’t used to seeing characters like themselves, if they fit one of the many categories portrayed here, will likely be more forgiving than I was." Dead Weight was published by Oni Press, and they have more info about it here. They also offer a video trailer for it here.